Like the anima in a man, the animus is both a personal complex and an archetypal image. Whereas the anima in a man functions as his soul, a woman’s animus is more like an unconscious mind. 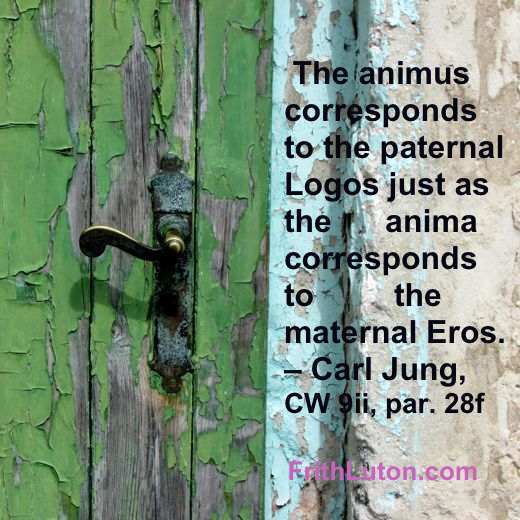 [At times Jung also referred to the animus as a woman’s soul. See soul and soul-image.] It manifests negatively in fixed ideas, collective opinions and unconscious, a priori assumptions that lay claim to absolute truth. In a woman who is identified with the animus (called animus-possession), Eros generally takes second place to Logos. The animus becomes a helpful psychological factor when a woman can tell the difference between the ideas generated by this autonomous complex and what she herself really thinks. Jung described four stages of animus development in a woman. He first appears in dreams and fantasy as the embodiment of physical power, an athlete, muscle man or thug. 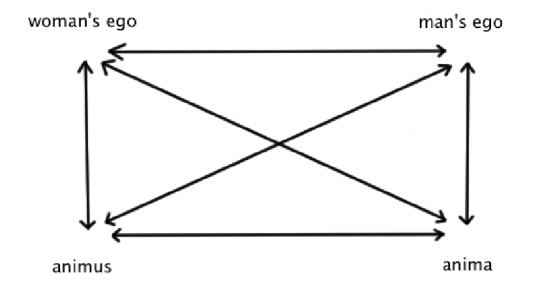 In the second stage, the animus provides her with initiative and the capacity for planned action. He is behind a woman’s desire for independence and a career of her own. In the next stage, the animus is the “word,” often personified in dreams as a professor or clergyman. In the fourth stage, the animus is the incarnation of spiritual meaning. On this highest level, like the anima as Sophia, the animus mediates between a woman’s conscious mind and the unconscious. In mythology this aspect of the animus appears as Hermes, messenger of the gods; in dreams he is a helpful guide. Any of these aspects of the animus can be projected onto a man. As with the projected anima, this can lead to unrealistic expectations and acrimony in relationships. While a man’s task in assimilating the effects of the anima involves discovering his true feelings, a woman becomes familiar with the nature of the animus by constantly questioning her ideas and opinions.